In a show of defiance, the surviving staff of Charlie Hebdo has placed a cartoon of the Prophet Mohammed on the cover of its first issue since the terrorist attack at its offices last week. Chosen by Charlie Hebdo's editors on Monday night, the cover was quickly revealed by Liberation, the French newspaper that is sharing its office space with staffers from the satirical magazine. A wide swath of French media outlets have already republished the cover in a show of solidarity. The chosen cartoon shows Mohammed holding up a sign that says "Je Suis Charlie," the now-famous slogan that became a rallying cry after 12 people were killed at the magazine's offices on January 7. The cover illustration also includes the words "All is Forgiven" -- a message that is open to interpretation. Liberation's news story about the cover said it was specifically meant to depict Mohammed -- a strict taboo within Islam. Many Muslims find depictions of the prophet to be deeply offensive, and there has been speculation that last week's attackers were motivated in part by past Charlie Hebdo cartoons. The highly anticipated issue, a copy of which was obtained by CNN, includes previously unpublished work from the slain cartoonists. It also includes a lengthy message of gratitude from Charlie Hebdo's editor in chief, Gerard Briard. "For one week now, Charlie, the atheist magazine, has been performing more miracles than all the saints and prophets combined," Briard wrote. "The one of which we're most proud is that you have in your hands the same magazine we've always published, created by the same people who've always done it." The magazine thanked the millions who have offered support and solidarity, and expressed hope that last Wednesday's shooting will serve as a watershed moment for tolerance. At a press conference on Tuesday, Briard said deciding how to do the issue's cover was "complicated." "It had to say something about us, and it had to say something about the event with which we were confronted," said Briard. Cartoonist Renald Luzier said he felt "catharsis" after drawing the cartoon on Thursday evening, a day after the attack. "I didn't know if it was going to be possible for me to draw, quite honestly." Luzier was quite emotional at the press conference, at one point pausing for several seconds as he regained his composure. Briar, the editor, said when Luzier showed the others the cartoon "we all burst out laughing and we jumped up with joy." At a press conference, Charlie Hebdo journalists spoke of the emotion of putting together an issue of their magazine in the wake of the terror killings. The new issue will be distributed to newsstands starting at 4 a.m. on Wednesday morning, and will go on sale the same day. The first of three million copies -- up from an earlier estimate of one million -- have already arrived under heavy security at a distribution center in a Paris suburb. Charlie Hebdo typically prints about 60,000 copies. Le Monde, the preeminent French newspaper, reported that the special issue will be printed in 16 languages; will be distributed in 25 countries; and will stay on sale for eight weeks. The publication is a triumphant moment for the magazine, and one celebrated by journalists around the world. It is also a highly provocative moment -- as the cover indicates. Many major news organizations, including CNN, generally refrain from showing images that purport to show the prophet. In recent days, executives at CNN have cited concerns about the safety of staff members and sensitivity towards Muslim audiences, but they have also indicated that the network's decision is subject to change. The New York Times, the BBC and Al Jazeera were among the other news outlets that chose not to show the new cover on Tuesday. The website of The Guardian newspaper showed the image, but included a warning to readers that "this article contains the image of the magazine cover, which some may find offensive." In France, the new cover was widely republished, by print publications like Le Monde, wire services like Agence France-Presse and television networks like France 24 and BFM TV. 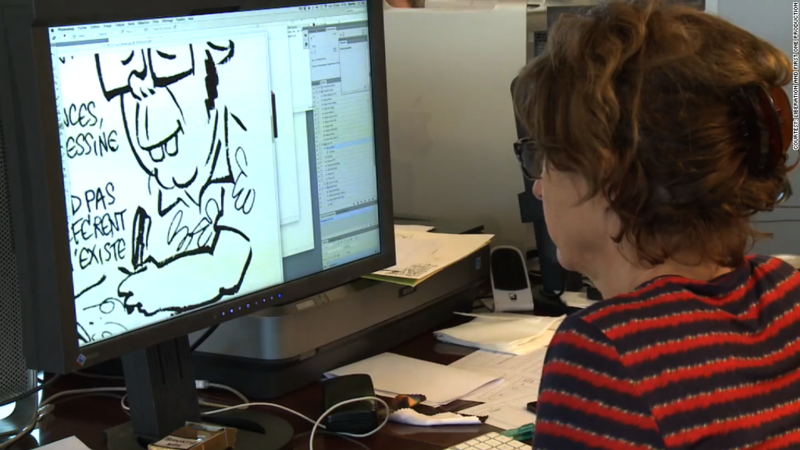 A Charlie Hebdo staffer at work on the new issue. -- CNN's Claire Calzonetti and Alanne Orjoux contributed reporting.